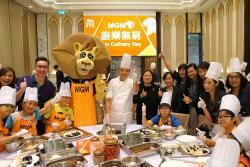 Ms. Wendy Yu, Senior Vice President of Human Resources of MGM; and Ms. Luo Ping, Vice Director of the Women’s General Association of Macau; posed for a group photo with children who participated in the Fun Culinary Day program. For the sixth consecutive year, MGM has held its annual Community Care Campaign in the summer to make great moments for the local community. This year, MGM organized two signature programs of the Community Care Campaign, Haircut for Love and Fun Culinary Day for members of the Women’s General Association of Macau to spread love to children and senior citizens. On August 13, 60 children aged between 6 and 10 from the Family Service Centre of The Women’s General Association of Macau were invited to MGM COTAI’s Ballroom. With the help of 25 members of the Golden Lion Volunteer Team and MGM Culinary Team, the children learned to make snacks and desserts in different shapes including animal-shaped sushi, rabbit-shaped mochi, creative cupcakes and mini snowy mooncakes. After the cooking experience, the children enjoyed the cute and delicious food they made with the volunteers. The volunteers in return delivered singing and magic performances to the children and a gift pack for everyone. MGM hosted the “Haircut for Love” program for the Lok I Elderly Care Center of Women’s General Association of Macau on August 8 for the first time. The MGM Volunteer Haircut Team provided complimentary haircut service to 60 senior citizens of the center, including those with mobility impairment, to give them refreshing summer makeovers. Established in 2015, the MGM Volunteer Haircut Team has now 49 members. All of them have undergone more than two months training to acquire hairstyling skills taught by professional hairstylists from the Hair & Beauty Professionals Association of Macau. The MGM Volunteer Haircut Team includes members of the management team and they devote their free time to providing complimentary haircuts for local senior citizens on a monthly basis. Today, the number of beneficiaries has grown to over 1,800 senior citizens, with a reputable response from all walks of our community.